Manufacturer and Supplier of a wide range of product Wood Coating Steel Door which include Steel Doors such as Steel Single Leaf Door, Steel Double Leaf Door, Steel Fix and Single Leaf Door and Security Steel Doors. Riding on unfathomable volumes of industrial expertise, we are offering an excellent range of Steel Single Leaf Door to our clients. The offered door is used to block off, and allow access to, an entrance to or within an enclosed space, such as a building or vehicle. Our skilled professionals only utilize fine quality raw material and innovative technology, while manufacturing this door. 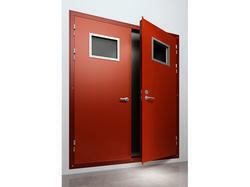 Moreover, our offered door can be availed in a wide range of dimensions, as per the requirements of our esteemed clients. 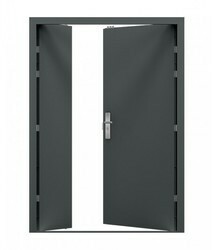 We are instrumental in providing our clients a comprehensive range of Steel Double Leaf Door. Our reputation in the market is largely attributable to our precision-designed Steel Fix and Single Leaf Door from our extensive collection of products. 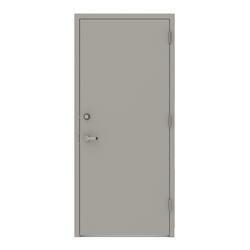 Being a customer oriented firm, we are engaged in offering a wide range of Security Steel Doors. Ideal choice for building applications offered doors are manufactured using optimum grade steel and sophisticated technology in synchronization with international standards.